Christmas decorations go up right after Halloween and Thanksgiving is all but forgotten. But, Thanksgiving is one of my favorite holidays and Fall is my all-time favorite season. Fall means sweaters and boots, hot apple cider and pumpkin spice lattes, baking and crafts. Okay, y’all know I’m not a big crafter. But, this year I wanted to make some fun place cards to set on our table for our Thanksgiving meal. I tried last year, but 13-month-old Timmy wasn’t havin’ it. This year I was determined! With help from Sara, Julia, Noah, and Ben, I made these cute little Turkey Day Place Cards for everyone. Hot glue three wine corks together to make a triangle. Glue the bobby pins to the bottom of the corks for the feet. Attach the red felt tear drops to the front of the cork with a bit of glue. Glue the pom pom to the top of the cork. Add beads and beak to the pom pom. 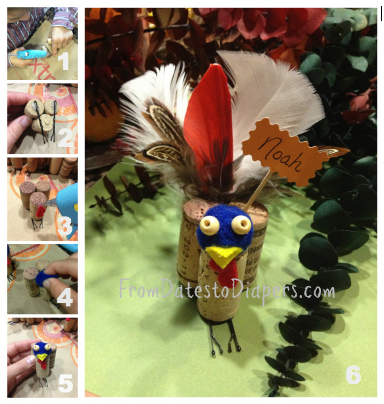 Glue a variety of feathers to the back of the two rear corks, and attach the name card with a toothpick. We made 23 of these little boogers! Let me know if you make some. Maybe tomorrow we’ll make Oreo Turkeys. You know, just because. They will be so beautiful on the table! You ladies and your children are much craftier than you give yourselves credit for!